Chinese team Pangu today released the first untethered jailbreak for iOS 9 devices, including the iPhone 6s and iPhone 6s Plus. The jailbreak tool is currently available for Windows only, but an OS X version will likely be available for Mac users in the future. Jailbreaking enables iPhone, iPad and iPod touch users to install unapproved third-party apps, tweaks, mods, custom themes, utilities and other content — called "packages" — from Cydia, an unofficial App Store for jailbroken devices. Jailbreaking has been around since the early days of iPhone OS 1.0, years before the software was renamed iOS, allowing users to have features such as custom wallpapers, quick reply and Notification Center widgets long before Apple made those official. As noted by iPhone Hacks, Cydia Substrate, an underlying framework for jailbreak tweaks, now supports iOS 9. Cydia developers will be required to update their jailbreak tweaks for compatibility with iOS 9 or later. The blog has shared a running list of iOS 9 compatible jailbreak tweaks. While jailbreaking allows users to further customize and enhance their iOS devices beyond the limits that Apple imposes, modifying your device's software violates your End User License Agreement (EULA) and voids your warranties — although the device can generally be restored to factory default settings through iTunes. It is highly recommended that you back up your data through iTunes before attempting to jailbreak your device, as you may encounter various issues or errors that could result in data loss or corruption. Pangu offers step-by-step instructions on how to use the iOS 9 untethered jailbreak on its website. Use the jailbreak at your own risk. 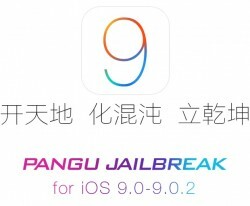 Pangu also has untethered jailbreak tools available for iOS 8 and iOS 7. Do you see f.lux in the App Store yet? Wonder if there will be a JailBrake for the Apple Car, which allows it to travel down roads and to locations Apple have not approved of? Of course, there are so many things you can do that Apple don't allow without a jailbreak. Believe it or not, they still do. I honestly don't get it, at this point in time. With all of the hacks, exploits, etc. out there, and the fact that Android software and hardware has evolved to the point where it's a viable option for someone who wants a higher level of customization. To each his own, I suppose. But I would never jailbreak iOS anymore. Yeah I don't see the point anymore. I remember jailbreaking and eventually having to restore my phone because it would become so unstable after a while. I don't get it etheir. Seems to me the security risks outweigh any benefit at this point. Now your able to side load applications ( via Xcode) in iOS9, I don't see much value in jail breaking these days.